Pushing on getting the little stuff done. Toivo, done and out. Carol Elizabeth, done and out. Hartford slide show, done and out. Chokers at Grassroots poster (2008) in process. Tweaking my buffalo picture. Adding a frilly funniness to make it seem more like a bandana/vintage tablecloth...that feels so much like that area and the styling there. Black/white/grey and yellow: reduced palette. I walked away from this image for a while...and it feels far more like its gelling. Plus, redid aspects of the eyes, and reduced the color further. 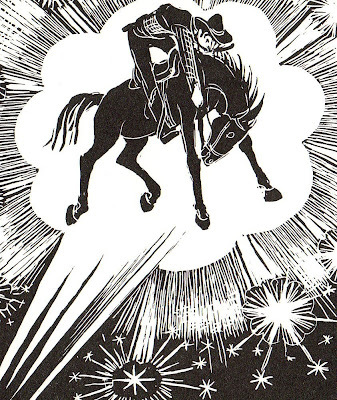 The image above is from Calico, the Wonder Horse written and illustrated by Virginia Lee Burton (of Saturday's post). This piece shows off her linoleum cutting--but what I love is the explosion shape that she captures the bucking horse in response to her studying comic books at the time. This device really works for me. This sort of energy is great...I wonder if current comic books have this sort of inspiration. Maybe a trip online? or down to Ithaca? The Ispot contacted me as they are posting a story about the SILA winners and will post the submission/image. When I get a link, I will post for you. Concert tonight. K has exams at noon. Cold and humid so the plants are happy and the grass seed, ecstatic.